Unless he again comes up with the age-old excuse that those pearls of wisdom were not spilled over on Twitter by him (but by a zany writer who manages his social networking better), Kamaal R Khan should do either of the two things. The self-celebrated critic and the so called opinion-shaper should either eat his words before letting out a big fat burp or marry Karan Johar! 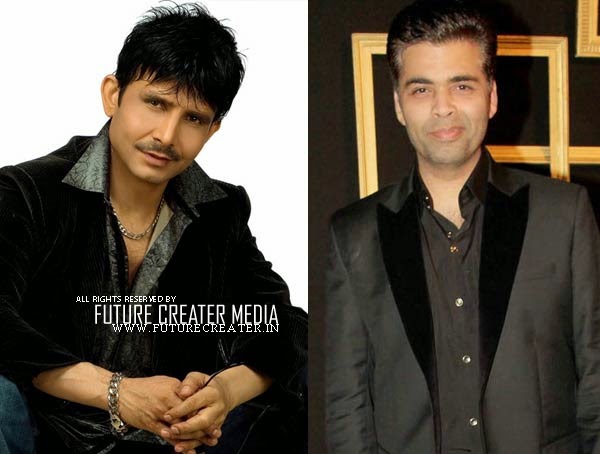 With Saffron wave all set to ‘Modi-fy’ the country and the BJP almost certain to come to power, we wonder if KRK will be seen walking down the aisle with a certain ‘Koffe’ show host ( that will be quite a sight to behold, we are sure) after having undergone the necessary “knife” procedure, of course! Bottom Line Gossip : The man also promised that he would leave the country if Modi wins. “Today I am leaving India forever as I promised. And congratulations to @narendramodi Ji for winning with majority. Hope for good government,” tweeted KRK. Well, we, for sure, have got a definite reason to celebrate the Modi victory. Wink-wink!